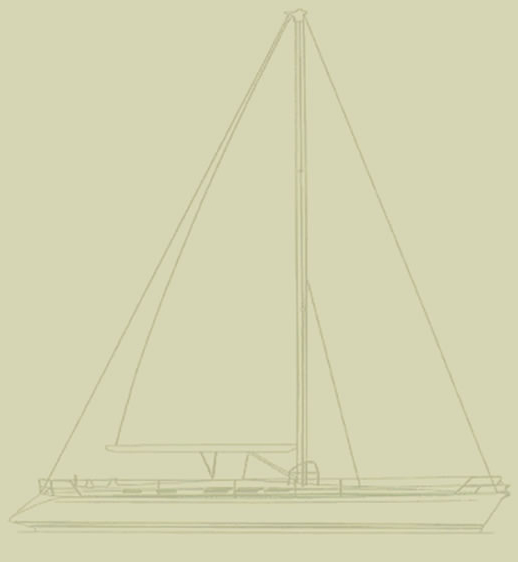 From the drawing board of French designers, Beret et Racoupeau, the Dufour 48 was designed with world cruising in mind. Ibis V is a supremely comfortable cruising yacht combining spacious and well appointed living and sleeping accommodation with exceptional sailing performance. The interior living space is light and airy with 2 twin cabins and 2 doubles, each with an ensuite heads (bathroom) and good storage. Her wide decks and cockpit are perfect for lounging at the end of the day’s sailing, and a stern swim platform and shower make for easy access to the surrounding blue water. Stepping into the saloon, you will immediately appreciate the space and light inside. Ibis has full home entertainment equipment for the exceptional rainy day and our ipod equipped stereo means you can quickly make yourself at home! 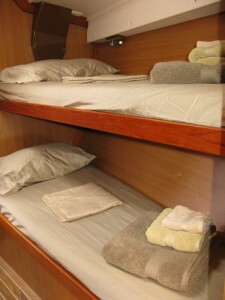 With 2 double ensuite cabins, 2 twin cabins sharing a large (for a boat!) shower-room. and a crew cabin forward, Ibis was designed for up to 10 people. 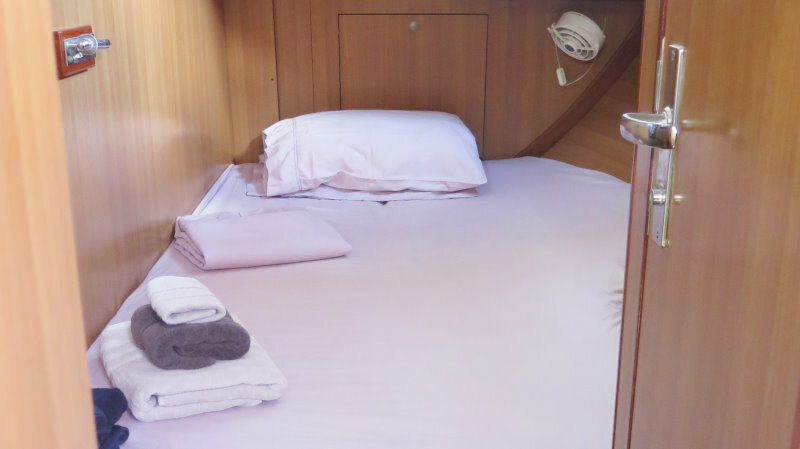 We sail more comfortably with a maximum of 6 and single travellers are easily accommodated with their own bunk and very often their own cabin. A fully equipped galley includes everything needed for preparing fresh, sumptuous meals with good local produce and our fridge-freezer ensures there’s always ice for those post-sailing sundowners. Our modern navigation station includes state of the art electronics as you would expect, and we’re happy to show you how it all works! * Office facilities are available as needed when in harbour however we do request you to keep their use to a minimum…..it is a sailing holiday after all! 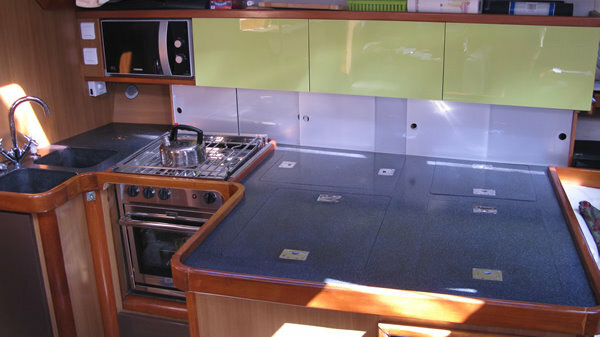 The galley boasts both fridge and freezer, a 3 burner stove, grill and oven, and hot and cold running water. Perfect for whipping up a gourmet meal and having ice in the pre-dinner cocktails! 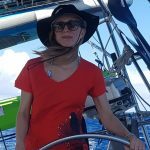 Sam was a late comer to sailing, starting in her mid 20’s but she gained her Yachtmaster in 1999 and has been skippering her own boats ever since. 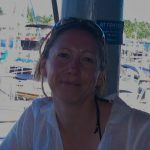 She loves teaching beginner sailors and helping others to gain new skills as part of a relaxing sailing holiday, is a good cook and takes care of pretty much everything on board. 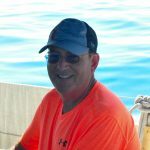 Sam loves the Caribbean sailing area and never ceases to be excited by the new adventures we have every day in this wonderful corner of the world. The spacious cockpit is perfect for sipping a cold sundowner whilst watching the sunset. It has an opening table for magical lunches and dinners under the stars and gas barbeque on the rail makes a fresco dining a breeze…ready in minutes for that fish you’ve landed! The large bimini fends off the fiercest midday sun and a sunshade means that your cabin stays cool and airy. Sun lovers aren’t forgotten, there’s plenty of deck space for soaking up the sun when we reach the anchorage, just don;t forget to lash on the factor 30! At the stern is a fold-down swim platform with easy access to the water via a teak bathing ladder. The swim-platform also hides a 10 person liferaft and the cockpit shower. 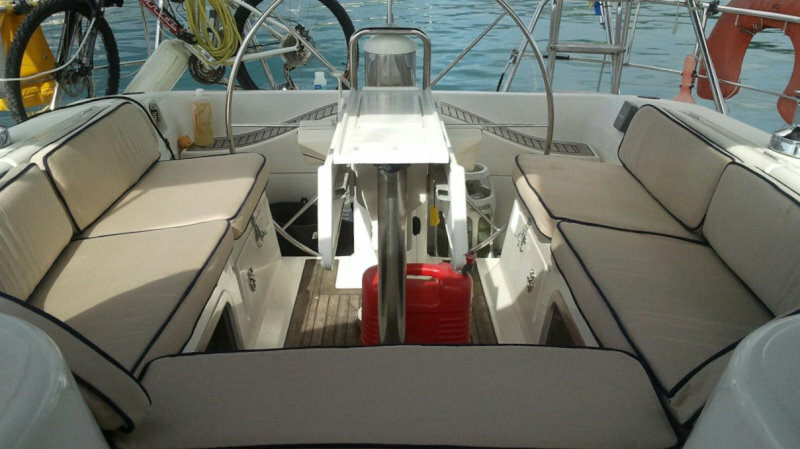 Our stainless steel goalpost doubles as the mount for the solar panels, wind generator and davits for the dinghy. Sail handing is managed with a furling genoa and fully battened mainsail with lazyjacks and an integral sail bag. With 6 large winches in the cockpit and 2 more at the mast, sail handling is well thought out for a boat of this size. Thank you so much for such an exciting adventure - it's something that will stick in our minds for a long time when we're back home. 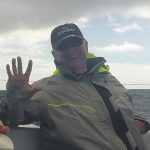 It's lived up to our expectations and more; the sailing was awesome, so many beautiful bays and sunshine sailing (mostly), and delicious food - don't know how you jiggle it all! First proper long sailing trip - first of many I hope.